Offering you a complete choice of products which include trolley mounted extinguisher. 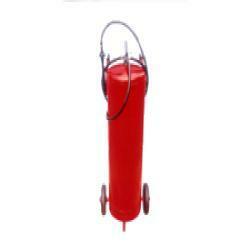 We have established ourselves as trustful entity developing highly durable Trolley Mounted Fire Extinguisher. We have gained specialization in presenting the industry compliant fire extinguishing equipments that is trolley mounted and offers reliable protection from A,B and C Fire Class. Suitable for fire caused due to wood flammable liquids, gases and electric ignition the offered equipment is designed as per set industry standards. We procure robust grade anti-corrosive material developing the highly durable fire extinguishing equipments that are filled with high quality propellant. Further, we are providing a quality tested range of trolley mounted devices at the best price.